The Q & A Residential Hotel welcomes the world’s discerning travellers to their polished and sleek downtown address. Located in the heart of New York’s financial district (FiDi), travellers visiting Manhattan will find their desires exceeded at the AIG Building at 70 Pine. An attentive doorman was ready to greet me as soon as I stepped out of my Uber. He swung open the doors and offered to take my luggage and then proceeded to guide me to the lobby. Despite the dreary rainy weather, the lobby looked bright, inviting and sumptuously decorated. With one-hundred-and-thirty-two rooms that are three times the size of a typical Manhattan hotel room, ranging from 500 to 1,400 square feet. 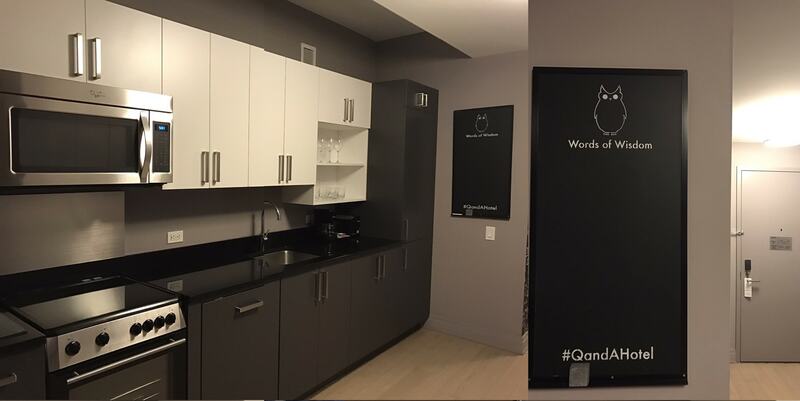 Every residence—studios to one bedrooms with separate offices to two-bedroom, two-bath suites—provides a fully-equipped kitchen. A handwritten welcome note and chocolates added a personal touch and definitely didn’t go unappreciated. Long gone are the days when a “good” hotel simply meant having free Wi-Fi and a coffee maker in the room. The Q & A Residential Hotels offers FREE international calls and the rooms have a smart HDTV, with more than 150 cable channels, including Showtime and HBO. When it’s time to do business, the Q&A provides a full range of 24-hour services to support easy enterprise across time zones. There are computers, printers, free WiFi everywhere, courier companies and other messenger and package delivery services, private boardrooms and top-of-the-line AV operations for meetings, screenings and presentations. La Palestra is the on-site health and fitness facility which is open to hotel guests and residents. Pets are also welcome at an additional cost. After spending some time at the hotel you will see how everyone goes beyond even the most extraordinary expectations. The Q & A could definitely become my new home away from home when in NYC. 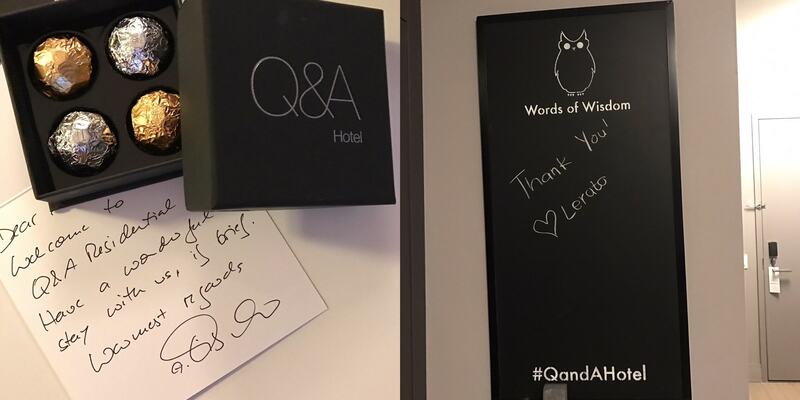 Disclaimer: my stay at The Q & A was provided complimentary in exchange for coverage on my blog. As usual all views are my own.